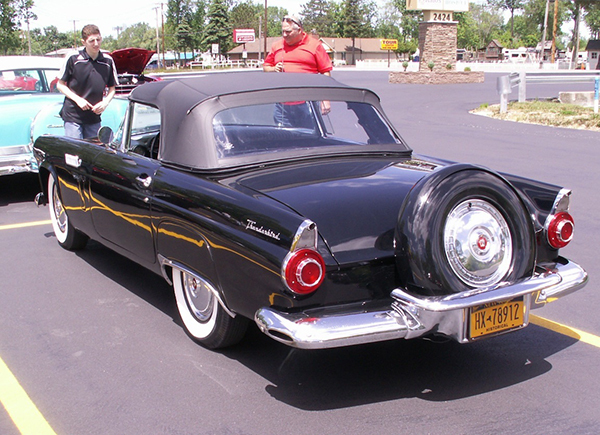 Check out these two guys checking out this 1956 Ford Thunderbird at a recent Sunday afternoon car show in Wheatfield. In the mid-1950s you had two choices if you wanted a mass-produced American-made two-seat convertible: a T-Bird or Chevy’s Corvette. In 1956 the Corvette was finally finding its niche as a true performance car, while the T-Bird was still a bit more of a boulevardier. By 1958 the race was over when Ford added a back seat. Oy! The T-bird has gone in and out of Ford’s lineup over the years, but the ‘Vette soldiers on to this day. Jim Corbran, RRofWNY Check out our new Facebook page: LuvTheCheapies The post RealRides of WNY appeared first on Buffalo Cars.